Jackson’s new DynaStar door-type dishmachine had operators in mind when it was designed! Featuring a built-in booster heater and low water consumption, it’s so easy to use! 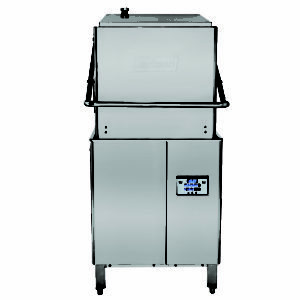 The DynaStar door-type dishmachine is designed as a pass-through model that offers plenty of clearance for loading and unloading. It can easily be converted as a corner unit in the field, allowing for racks to pass forward and to one side instead of side to side. The full wrap-around handle is designed to make it easier on foodservice operators when opening and closing the unit, and the easy-to-use digital control panel is easily navigated for ultimate performance! This ultimate performance is achieved by utilizing the triple wash arm design to create a column of water over and under the dish rack for a more efficient and effective wash. Dishes are sanitized with 180°F rinse water from the built-in booster heater, while utilizing only .69 gallons of water per rack. It’s brand new and available now!